Souverän™ is The Wax for Perfectionists! Pinnacle Souverän™ Carnauba Paste Wax is the wax for perfectionists, so named for it's dazzling, 3-dimensional depth and unmatched brilliance. Formulated with premium grade carnauba, nature's finest wax, Souverän™ is designed to exceed the standards of the most discriminating enthusiast and collector. In fact, this wax is responsible for the dramatic shines on winning show cars at major concours events, time and time again. Today, Souverän™ still reigns as the ultimate show car wax. Each 8 oz. jar contains approximately 30 applications, each packed with genuine carnauba wax. A single jar will give your vehicle years of incredible shine and protection. Pinnacle Souverän™ Wax is the most cost effective car wax on the market! We've created this wax for perfectionists like you. Pinnacle Souverän™ Wax produces a shine that is more than just bright. Our finest car wax is bursting with a special blend of Brazilian Ivory Carnauba and natural oils to give the paint tremendous depth and richness. It creates a liquid and 3-dimensional appearance on the paint. Souverän™ Wax enhances all colors but is stunning on dark colored cars. Reds radiate energy. Blacks take on the shimmer of an infinitely deep pool. 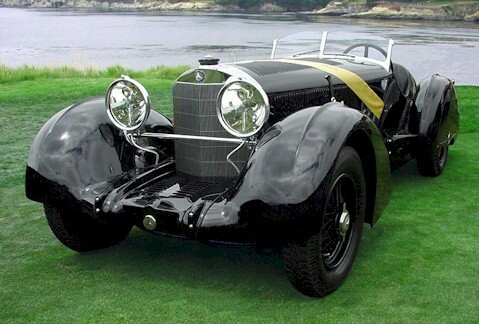 Pebble Beach Concours d'Elegance Best of Show. Prepared and shown with Pinnacle Souverän™ Wax. 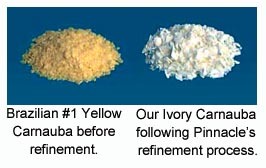 The prime ingredient in Pinnacle Souverän™ Wax is Brazilian Ivory Carnauba. 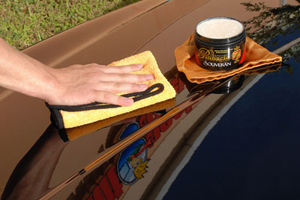 Carnauba wax is world-renown for its crystal clarity, its protective properties and its uncanny shimmer. The wax is produced by a specific tree that grows in the hot, wet valleys of Northern Brazil. The leaves secrete the wax in order to protect themselves from the tropical sun and to shed rainwater, which falls to the tree's roots. Carnauba wax has the distinction of being the hardest natural wax and it has the highest melting point of any natural wax. No other natural wax is as sought after as No. 1 yellow carnauba wax, deemed the purest and highest quality by Brazil's government inspectors. No. 1 yellow carnauba wax is the only wax found in Pinnacle Souverän™ Carnauba Car Wax. We took the highest grade yellow carnauba wax available and refined it once more to make an ivory- colored wax of unbelievable clarity and purity. Even in its natural state, carnauba provides excellent UV protection, is heat resistant, and yet is breathable to allow the leaves from which it came to receive oxygen. Pinnacle's ivory carnauba retains all those characteristics but allows for a perfectly clear, rich finish when applied to automotive paint. We've added natural oils to the carnauba in order to "wet" the paint. This combination of ingredients is what gives Souverän™ Wax its distinctive, wet-looking shine. 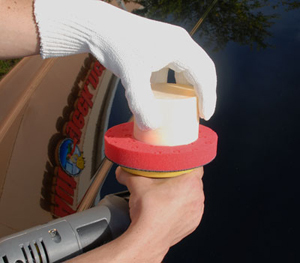 Particularly on dark-colored vehicles, this wax creates a deep, fluid finish that comes to life under changing light. Pinnacle Souverän™'s buttery texture enables it to be wiped off easily with any towel, but you'll find it absolutely effortless with the Gold Plush Jr. Microfiber Towel, included with our compliments. The Gold Plush Jr. Microfiber Towel has a luxurious 70/30 blend of baby soft polyester and polyamide fibers woven into a plush cloth. With no looped hems, the edges of the cloth are as soft as its middle. This premium cloth has excellent "grip" to polish away Pinnacle Souverän™ wax and uncover a breathtaking shine. This 16 x 16 inch microfiber cloth will become an instant favorite. Pinnacle Souverän™ Carnauba Wax is terrific in climates of high heat and humidity. It wipes on effortlessly and resists hazing and streaking. Every car comes out perfect. It's a detailer's dream come true. Pinnacle Souverän™ Carnauba Wax is hand poured, one container at a time, and boxed with an applicator and a Gold Plush Jr. Microfiber Towel. Availability is limited. 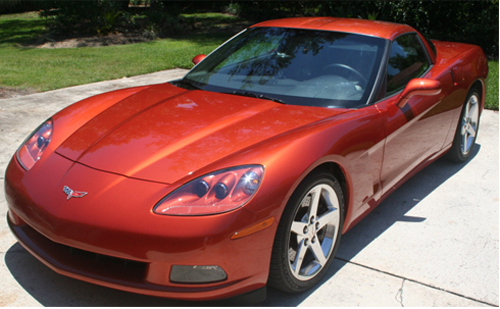 Pinnacle Souverän™ Wax brings out the orange highlights on this Sunset Orange C6 Corvette. Photo and detail by I. McMillan of Longwood, FL. Wash vehicle using Pinnacle Bodywork Shampoo. Towel dry with a microfiber towel, such as the Cobra Ultimate Guzzler . If applying Souveran for the first time, use Pinnacle Paintwork Cleansing Lotion to reduce the appearance of imperfections and to remove wax build-up. Apply Souveran by hand using a Polyfoam Wax Applicator . Apply a thin, even coat to one panel at a time. Souverän does not dry to a haze. Once you’ve covered a panel, you can immediately buff using a Gold Plush Jr. Microfiber Towel. Put a plastic sandwich bag or a microfiber glove over your hand and work the wax out of the jar. Rub the wax onto a soft foam finishing pad. Turn the Porter Cable 7424 (or any dual action polisher) on between 3 and 4. Apply Souveran in a thin, even coat over one panel at a time. There is no need to apply pressure. Buff using Gold Plush Jr. or a microfiber bonnet over a lambswool pad. Turn the bonnet inside out if it becomes caked with wax. Maintain the crisp, clear reflection with regular applications of Pinnacle Crystal Mist Detail Spray. any paint sealant. Photo and detail by Scott B. in Florida. Souverän™ is a trademark of Palm Beach Motoring Accessories.